To say that this was good would be an understatement. Not that I usually try and make things taste like fast food but come on we all know the sense of contentment when that one burger from your favorite fast food place hits the spot and a smile crosses your face. Then we look around to make sure no one saw that. Well this is that sandwich! 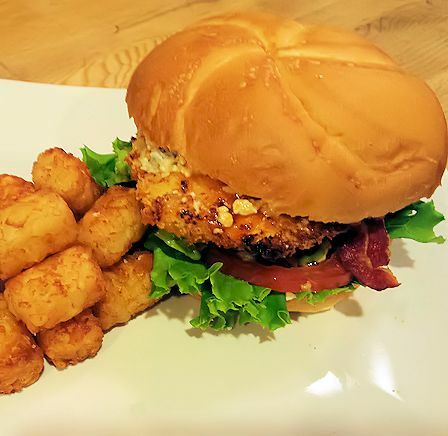 Melty blue cheese, bacon, warm kicked up Texas Pete sauce and crispy baked Panko breaded chicken..oh did i say bacon? 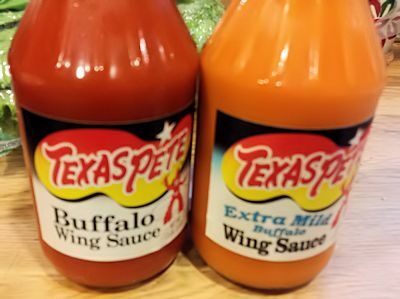 Ok let do this…..
2 TBS each or more if desired Texas Pete Mild or Medium sauce.. or both! Next set up your breading station. Put two eggs in a bowl and beat with a fork add about 2 Tbs of water and beat in the eggs just to thin it out some. 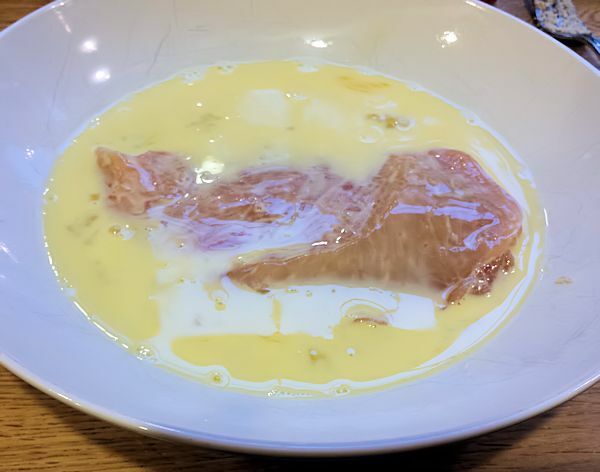 When you make scrambled eggs, the omelet will be fluffier and you wont have that runny egg consistency after they are cooked if you use water instead of milk. 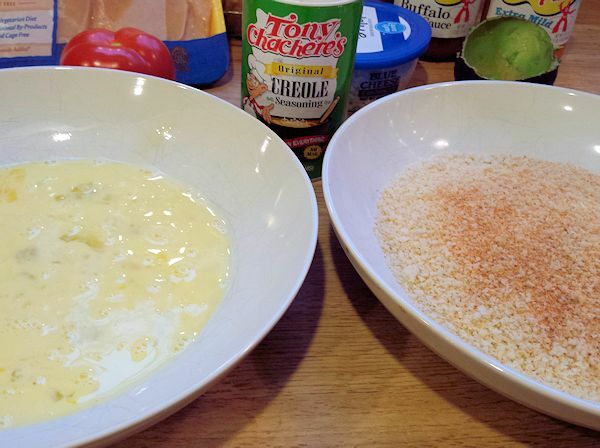 Try it, it was a great tip from a good chef 🙂 In another bowl, put the two cups of Panko bread crumbs and add in 1 to 2 tsps of Creole/ Cajun or soul food seasoning. 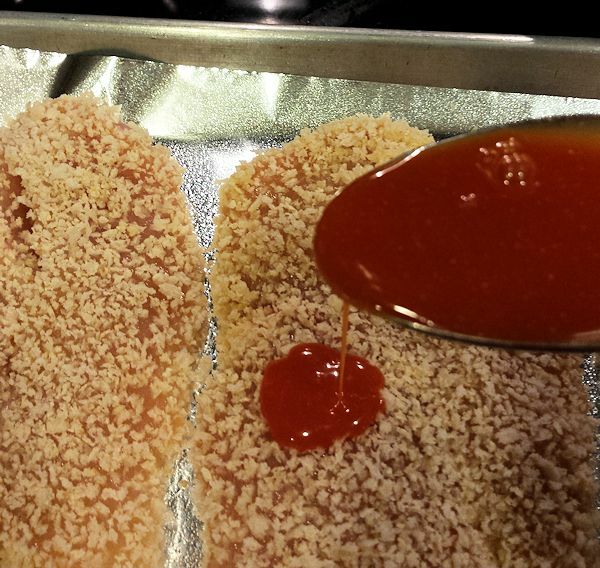 Dip your chicken into the egg mixture and then into the panko being sure to evenly coat both sides. 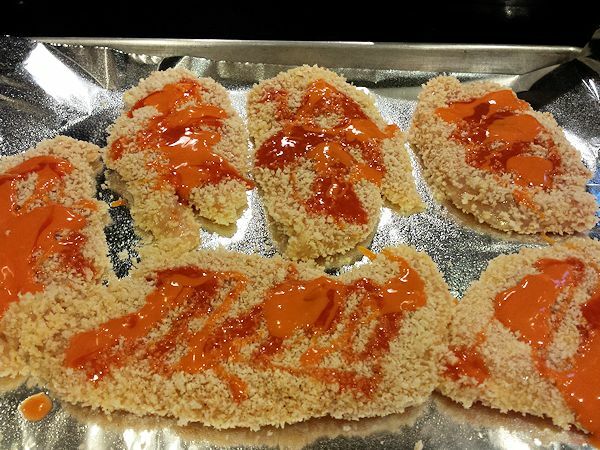 Set coated chicken onto sprayed baking pan when each piece has been coated. Place chicken into oven and let it get golden brown. 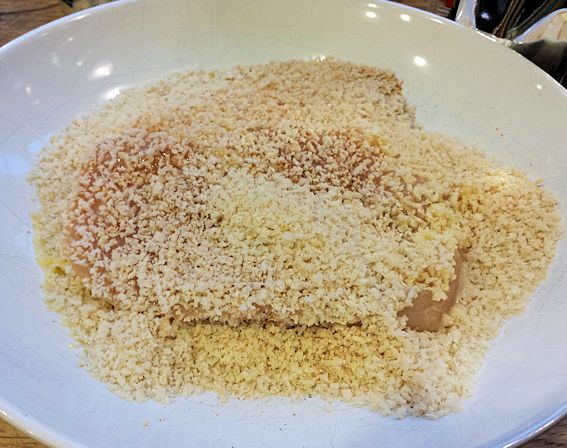 The Panko will stay nice and crispy, which I love. Since these are thin breasts they will take only about 20 minutes. Test for doneness. Your chicken should be at 165 degrees. If for some reason you can not find the thin sliced, you can always get the regular and fillet it yourself by cutting in half on the horizontal. While the chicken is cooking, prepare the plate. 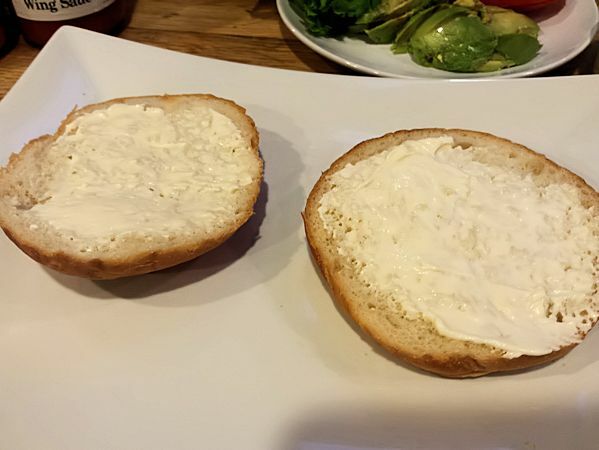 Buns, add mayo to each side only about 1 Tb each should do it. 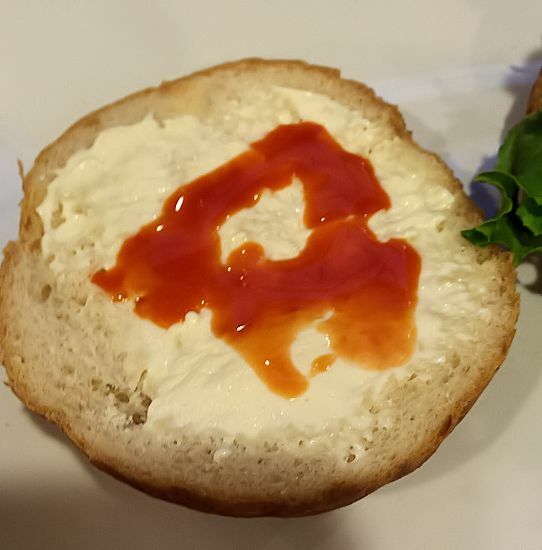 Mayo or Vegganaise you choose your way. 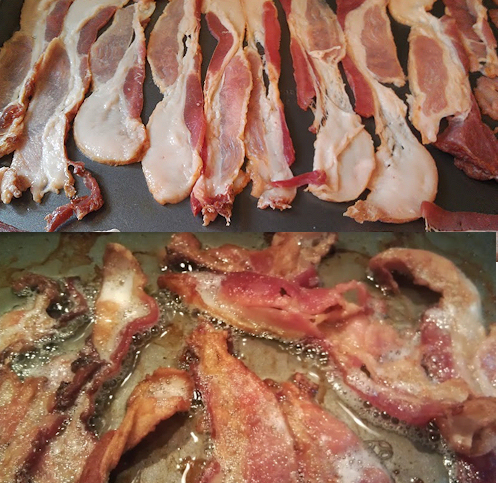 add the blue cheese crumbles to one side ….I like a little you may like a lot like below..there is no right or wrong here. 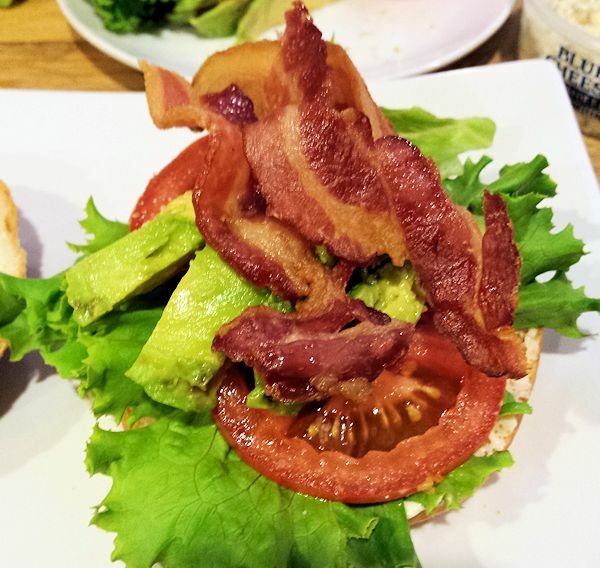 On the other side start layering the good stuff, lettuce, avocado, tomato and of course the bacon. 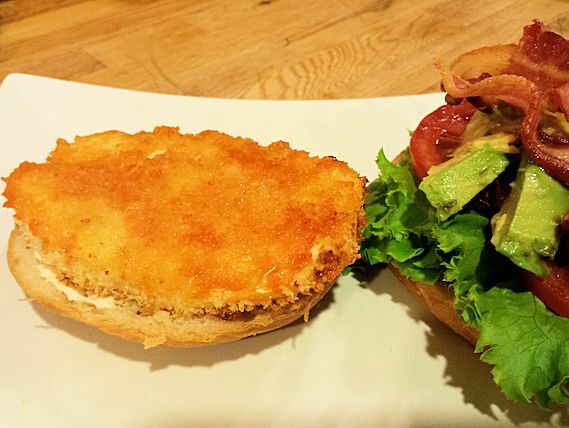 When your chicken is done….put it on that bun! Time to close it up and enjoy. 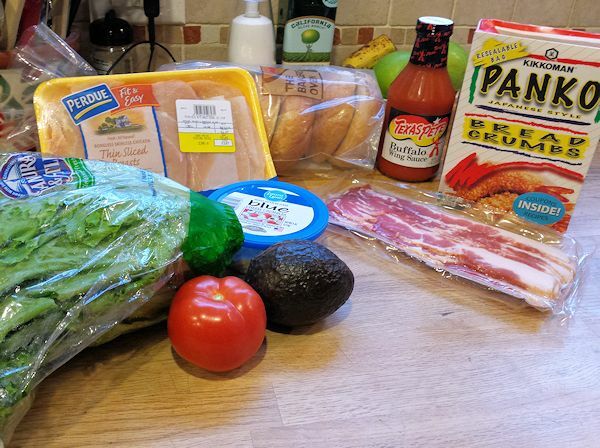 This sandwich really is an amazing version of a fried chicken club, but by not frying it you are saving tons of calories. Want to save even more? 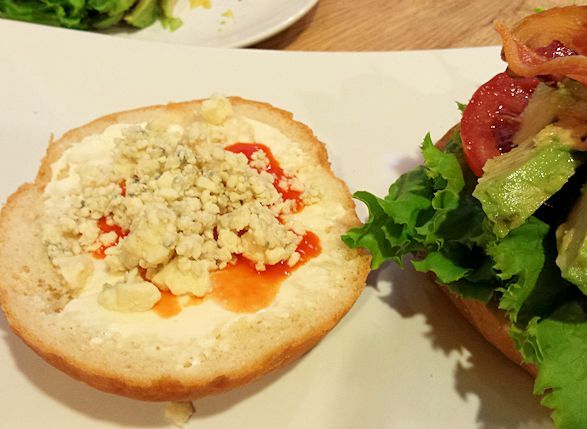 Forgo the bun and try this on a salad…Enjoy!! 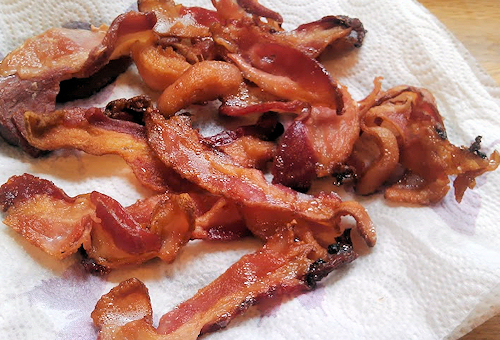 Bacon hint: Put bacon on baking sheet and right into cold oven set oven to 450 and in about 10-15 minutes, your bacon will be done to perfection without the mess. Dry on paper towels and set aside.